Administrators closed Kenya’s oldest university on Tuesday, citing fears for student safety in a planned protest over police beatings at a campus demonstration last week. Kenyan police often face accusations of brutality and extrajudicial killings from civilians and rights groups, but officers are rarely charged and almost never convicted. Despite this, Kenya receives substantial financial support for its security services from international donors, including the United States and Britain. Rights groups say at least 28 people were killed, mostly by police, in unrest following the August election, whose results were later nullified by the Supreme Court due to irregularities. A re-run of the presidential vote is scheduled for October 26 and conduct of police will be closely watched. On September 28, University of Nairobi students protested the arrest of an opposition lawmaker. Police responded by entering dormitories and classrooms, dragging out students, beating them with clubs and firing tear gas, according to a Reuters witness. The university said 27 students were injured. A police spokesman did not respond to requests for comment but a presidential spokesman told local radio on Monday robbers were hiding among the students. On Tuesday, students planned to demonstrate the beatings but administrators shut down the university. “The University Senate decided to send the students home for their own safety,” John Orindi, university corporate affairs director, told Reuters. On Tuesday morning, riot policemen stood near a truck with water cannon outside the campus gates. A 20-year-old veterinary student who did not want to be named for fear of retribution said students wanted the vice chancellor to resign “for allowing anti-riot police to enter campus and seriously injure students”. 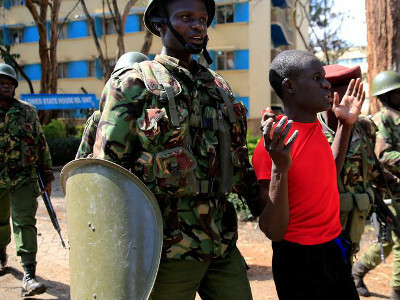 University officials had talks on Monday with the interior minister, police chief and the head of a Kenyan government watchdog charged with investigating complaints against the police.